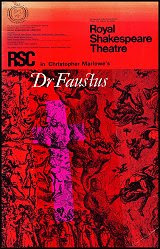 Jan's Writing Journal: " The First Time Ever I Saw Doc Faustus...."
" The First Time Ever I Saw Doc Faustus...."
ANYHOW, on Wednesday, a friend and I treated ourselves to a film showing of The Globe Theatre's production of "Dr Faustus". This one starred Paul Hilton as Dr and Matthew Dunster was Creatives Director. IT was a DELIGHT. It was a delight, particularly visually and audibly ( great clashing music to scream by/shiver by....BUT yes, I know, "Delight" seems totally the wrong word!!) ........BECAUSE this production was grotesque, blatant with evil.....darkly sinister, gut wrenching. The set ( in the superb Globe) was fabulous....costumes varied and scaring......ugly, horrific, gorgeous, comic. In fact, there was lots of roaring comedy in this production...almost pantomime, linking in crazily with the terror and magic. I was totally gripped..... to the very last view of this vivid and memorable treat. ......Sheer Delight! ****ALSO this week went to M/Chester Opera House for a production of Agatha Christie's " Mouse Trap" It's touring to celebrate its 60th Birthday. We guessed The Killer pretty fast.....BUT as commanded by one of the ators as the curtain fell, we won't divulge the truth to anyone who has yet to see it....! . Just wondering if Reg is still alive, do you know? He would be a good age if he was. Remember meeting him several times with Florrie. AL ( little bro!) had lunch with him not that long ago and enjoyed his company very much. I still hear from him each Christmas. Good to hear from you. I'm afraid I've given up visiting other blogs as it seems to eat up time unbelievably...so it's good to have comments from you. Trust all well with family also Philippa's.